I am SO excited! Excited enough to be treating you to TWO posts and two fun projects! Today is the beginning of Sale-A-Bration! The biggest and best promotion of the year, and with a 20 page brochure packed, and I mean PACKED, with free products for you to earn for FREE, you're sure to find something to love!! This year's SAB exclusive collection just blew me away, there are so many gorgeous things the only problem is choosing which one to get! You can earn the free and exclusive products - stamp sets, designer paper, accessories, punch, embossing folder, home decor kit or mds packages - each time you spend £45 between January 28th and March 31st!! 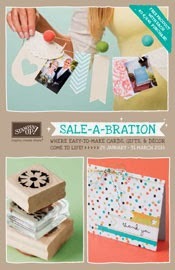 Check out the Sale-A-Bration brochure now!! 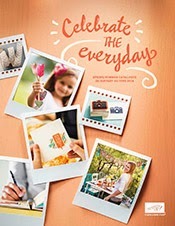 Just incase a fabulous brochure of free Stampin' Up goodies wasn't enough, its also the launch of the Spring/Summer seasonal catalougue today. It likewise is just beutiful, why not take a few minutes, put your feet up with a cuppa and have a browse through both catalogues? Check out the Spring/Summer catalogue now!! When you've compiled your wishlist why not head over to my online shop and treat yourself to a few goodies and choose a free SAB item while you're at it? Everything will arrive direct to your door in just a few days so you can begin playing right away! Alternatively, you can really get the party going by hosting a party of your own - you'll get TONS of free stuff just for inviting friends and family over for a relaxed and fun time crafting and nattering! Contact me today for more info or to book your party! So, let's celebrate today with a bright and fun card, shall we?! This super fun and bright card would be just perfect for anyone's birthday! Its also totally flat (the linen thread ties so tightly there's no bulk) and lightweight so its perfect for popping in the post without costing you a small fortune! Now you could totally do this card without the punch, just use the stampin-ma-jig to get everything lined up just the way you'd like it. I chose to stamp and punch so I could move everything around and switch up colour and patterns until I was happy. I really love the little banner detail along the bottom edge - its another different way to use the banner and just filled that dead space I had kicking around perfectly!